The best way we learn anything is by practice and exercise questions. We have started this section for those (beginner to intermediate) who are familiar with PHP. 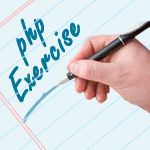 Hope, these exercises help you to improve your PHP coding skills. Currently, following sections are available, we are working hard to add more exercises. Happy Coding! Note: It's fine if you are playing around with PHP codes with the help of an online PHP editor, to enjoy a full-fledged PHP environment (since online editors have several caveats, e.g. embedding PHP within HTML) up and running on your own machine is much better of an option to learn PHP. Please read our installing PHP on Windows and Linux if you are unfamiliar to PHP installation. Note : You may accomplish the same task (solution of the exercises) in various ways, therefore the ways described here are not the only ways to do stuff. Rather, it would be great, if this helps you anyway to choose your own methods.